‘The Victoria Vanishes’ is making an appearance unabridged (hurrah!) on audio books now (CDs) A nifty new cover, and the ever excellent Tim Goodman reading to you while you’re tucked up in the warm, watching the rain course down the windows in this typical British summer. Minding my business on a lazy Sunday night, reading my favorite author’s website when I came across your Palin comments….I haven’t laughed that hard since seeing my friend’s face after eating Marmite for the first time. Absofuckinglutely brilliant!!!! Now I love you even more!!!! This American thinks you are a star. Think she can be worked into a future Bryant & May book? 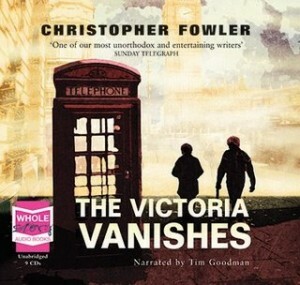 Absolutely loving the audio of The Victoria Vanishes. Makes my day/week/month when I find out that there’s a new one out. I adore Tim Goodman’s interpretation. Working in a library I’m able to foist these audio books on unsuspecting borrowers and tell them that they’re in for a treat. Please tell me the origin of the names of Bryant and May. Origin of the names of Bryant and May? UK company that made matches – possibly still do.